Initially met with caution by DoPs, gaffers, photographers and the like, LEDs have proved themselves to the market in numerous applications and are no longer considered the newcomers they once were. After all, lighting in film, photography and documentary making is an art form, and the most critical component of creating the right atmosphere, portraying the mood of a scene and drawing audiences in to the story. The LED market is incredibly fast paced and has changed dramatically in just the last few years. So what is driving this change? It all comes down to customer demand. As more users recognise the benefits of using LED fixtures on set and on location, the need for better performing lights, with consistently high colour accuracy and increased functionality has become clear. One common misconception is that all LEDs deliver the same level of energy efficiency saving. Instead, as with most technologies, there are in fact significant differences between brands with respect to their power consumption. Some LED fixtures outperform their competitors by as much as 300% in terms of efficiency and run-time on batteries. Energy efficiency matters because a DoP doesn't want to worry about how long the battery will last or whether he has enough replacements for an entire shoot. Rather, he needs to focus on getting the shots he needs. Importantly, it also means less batteries are needed on shoot, reducing weight and increasing portability and allowing more time for creativity. Similarly, for TV and news studios a 300% difference in energy consumption can make a significant impact on energy bills and operating costs. One of the most important considerations to take into account when choosing an LED light, is their colour accuracy. Historically the benchmark standard for assessing this has been the Colour Rending Index (CRI). Initially developed for tungsten lighting, CRI is not the most accurate indicator of colour accuracy as it focuses more on how the human eye perceives colour. It is also easily manipulated and therefore difficult to directly compare the relative scores of light sources. Indeed, many manufacturers only quote a single CRI number known as 'Ra', which is an average of typically 8 colours. But this can mask problems in the colour spectrum in a particular colour band, and importantly does not include Red (known as 'R9'), a particular problem area for many LED light sources, nor does it include skin tone accuracy (R15). Instead, a new standard of measurement is increasingly being adopted the Television Lighting Consistency Index (TLCI). Developed by colour science expert Alan Roberts (and now adopted by the European Broadcast Union) TLCI has a significant advantage over CRI because it has been developed specifically to focus on the colour gamut of television cameras, and provides specific advice on how much work a colourist would need to do in post production to achieve a suitable standard for television. While colour accuracy, energy efficiency and performance remain important features that DoPs, gaffers and photographers expect, the future of the LED industry is in delivering products that ultimately save users time, money and effort, while enabling and enhancing their creativity. The Rotolight Anova Pro is one such development. 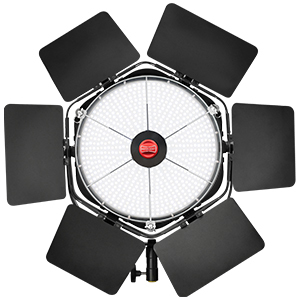 Featuring a number of industry-first features, the location and studio bi-colour LED light is known for its powerful, yet soft light output and catch light effect due to its round shape. The light offers AccuColour¢ technology for exceptional colour rendering, and dual controls for fast, tuneable colour aided by an accurate colour temperature display. In addition to being a powerful key light, it also incorporates a powerful suite of customisable lighting effects in its CINESFX¢ function. CINESFX helps users simulate various types of light, such as strobe, fire, police, TV and gunshots for use on feature films, television and independent productions. The inclusion of this feature into the light itself means that DoPs and gaffers no longer need to buy or hire a flicker box, which traditionally has been used to recreate these types of effects, and it saves hours of setup time required with legacy flicker box workflows. The real advantage is that CINESFX is easy to use and allows operators to be more versatile during a shoot without losing time or spending additional money. CINESFX already has its fans in the industry already. Stefan Lange, a visual special effects veteran and Emmy Award winner who has worked on films like Batman, Skyfall and Dark Shadows, said: "The CineSFX mode that's built into the Rotolight Anova PRO is an advantage to any production. It's fast - it doesn't matter if it's a feature, a drama or a documentary, it's always going to come out and fill that little bit of, and add that little effect. There isn't a job I wouldn't take it on." As LED becomes the established go-to product for the broadcast, media and entertainment industries, and the market and competition in the sector reaches saturation, it will become increasingly important for LED manufacturers to find unique ways to differentiate their products. This will result in new lighting innovations to enhance creative possibilities, and ultimately save DOPs, gaffers and producers both time and money, with consistent, high quality LED lighting.